The 6ft x 6ft Waltons Reverse Overlap Apex Wooden Shed is perfect for storage of general garden items. This high-quality garden building features 8mm thick overlap cladding that has been attached to a 28mm x 28mm wooden frame to create a traditional finish that is durable and robust. This shed comes with a 10-year anti-rot guarantee because we have full confidence in the quality of our timber. The reverse apex roofline provides extra internal head room, this also helps with water drainage which helps with protection against rot. Quality sand felt is supplied as extra protection against the elements. The single window is made from styrene glazing, which is 100% shatterproof, making it a safer alternative to traditional glass. The roof and floor have been built using a 9mm thick solid sheet material, this provides a rigid base that won’t sag when storing heavier items. The single door has been braced with ledging to provide extra support, a pad bolt is included for security. Our Reply:Good morningThank you for leaving your feedback regarding your recent purchase and it is good to know that you are happy with your new garden building. 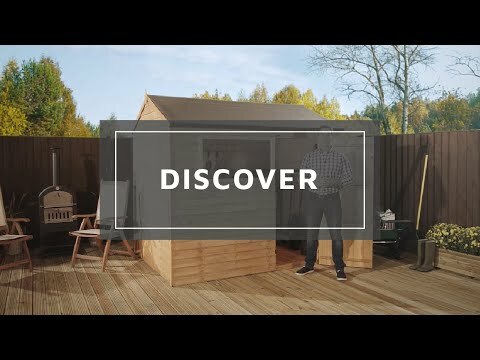 Our Reply:Good afternoonThank you for your feedback, I hope you enjoy your shed once you have built it. If you have any queries, please do not hesitate to contact us. Thank you for taking the time to leave your feedback regarding your recent purchase. Thank you for leaving feedback today. It is good to know that you are happy with your purchase and hope that you may have many years enjoying it. It is great that you are happy with the quality of your overlap shed and that you found it was good value for money. Thank you again for your great review. Review:Great product, arrived on time, delivered safely and easy to assemble. Would recommend Waltons. I am delighted to know that you are pleased with the quality of your overlap shed and that assembly went well. It is also great that you would be happy to recommend Waltons. Thank you again for your positive review. Our Reply:Thank you for the positive feedback. Much appreciated. It is wonderful to know that you are happy with the quality of your overlap shed and that assembly was straight forward. Thank you again for your wonderful feedback. I am very pleased that you are happy with the quality and value for money of your overlap shed and I thank you again for your positive feedback! Review:This is a great shed. I had a look around elsewhere and thought some of the other similar sheds were a little bit flimsy feeling. This is perfect for the money. I did need some help putting it up, but that's more my lack of DIY knowledge. I am so pleased to know that you are happy with your overlap shed and you found it to be of great value for money. Thank you for your great review. It is grate knowing you are happy with your overlap shed and that assembly was straight forward. Thnk you again for your review. Review:Poor quality and flimsy. Panels warped. Poorly designed and poor instructions for putting shed together. Review:Very good quality. Easy to assemble. Our Reply:I am glad that you found your overlap shed to be easy to assemble and of very good quality. Review:I'm afraid that I didn't think the product was of a good standard....the main panels didn't fit well and some of the individual panels were warped and will need to be straightened. As for the floor........don't think we will be putting too much in the shed and certainly won't be standing on it!